This product is very high-quality. I have no complaints whatsoever. It blocks out all green light just like it should. Thanks DL! I ordered two pairs of these glasses. I consider them to be both highly effective and very good value. The quality is top-notch too. Highly recommended. What can I say, it works well and is critical for high powered lasers. Fit is pretty good and coverage is excellent. Loved the fact that they each came in a micro-fibre bag with a cleaning cloth. Excellent quality glasses. I can barely see the laser even on white surfaces. Highly recommended. 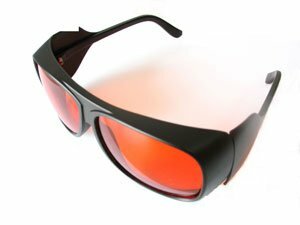 These glasses are very effective, and successfully reduce >2W of indirect laser light off a white surface to a very low level. Only adverse comment is that they don't fit my face perfectly. I am highly satisfied with my safety glasses, they are durable and professional and live up to their specifications. I would recommend them to any hobbyist or researcher who uses lasers in their work. Dragon Lasers is always a pleasure to do business with.